Solomon Islands Oil Spill Expanding Toward UNESCO Site A ship ran aground more than a month ago, and a gash on its side is leaking oil. There's growing outrage that the companies responsible are not taking action to stop the environmental destruction. Australian officials say an environmental disaster is unfolding in the Solomon Islands after a ship ran aground and began leaking oil next to a UNESCO World Heritage site. The Hong Kong-flagged cargo ship, called the Solomon Trader, got stuck when it was attempting to load bauxite during a cyclone on Feb. 5, Radio New Zealand reported. The island's reef tore a gash in the side of the ship, endangering what UNESCO describes as the "largest raised coral atoll in the world." Since then, it has dispersed some 80 tons of heavy fuel oil into the sea and onto the shoreline, Australian authorities say, and more than 650 tons are still on the ship. "There is a high risk the remaining heavy fuel oil on the vessel ... will be released into the surrounding area," Australia's Department of Foreign Affairs and Trade said in a statement. Aerial footage taken by the Australian government shows the spill extends about 3 1/2 miles across the shore of Rennell Island and is moving closer to the World Heritage site. The Solomon Islands government had initially requested that Australia provide technical advice; now, as the disaster escalates without effective action from the companies involved, Australia is deploying teams to try to reduce the effects of the pollution. 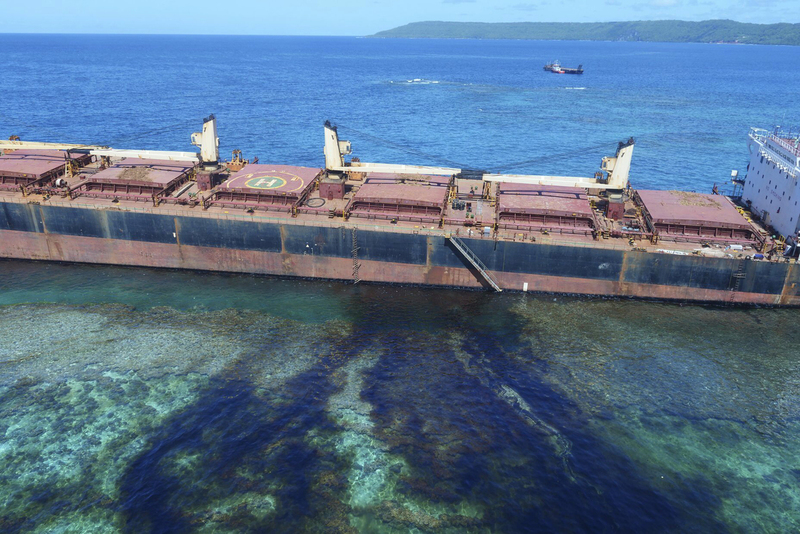 Australia says the Solomon Islands government has made it clear that responsibility for salvaging the vessel and cleaning up the damage rests with the businesses that caused the spill – owner King Trader Ltd. and its insurer, Korea P&I Club. Local and maritime publications say the ship was chartered at the time by a company called Bintan Mining. "It's part of our life," Singamoana said. "We usually use the reef. We also rely on seafood." About 1,200 people live within the World Heritage site on the east side of the island, according to UNESCO, and they live "mainly by subsistence gardening, hunting and fishing." UNESCO calls the site a "true natural laboratory for scientific study." It contains many species that exist only in this area. The site contains thick forest and the brackish Lake Tegano, which contains many unique limestone formations. As Radio New Zealand reports, "Pictures from the area have shown normally bright blue water darkened by oil slicks, white sand blackened by sludge, and interviews with residents have told of a heavy stench that makes breathing difficult." "It is of the utmost importance that any damage to the World Heritage property and the livelihoods of the local communities is fully covered by the responsible company, owners and insurers," Mechtild Rössler, director of the UNESCO World Heritage Centre, said in a statement. According to The New York Times, the ship's insurer on Wednesday "expressed 'deep remorse' on behalf of itself and the vessel's owner, King Trader, though it said that 'matters of liability are yet to be determined.' "
"Inclement weather has made it difficult and at times impossible to access the vessel, and conditions have been too dangerous for external underwater inspections — a key assessment ahead of salvage operations progressing in earnest," the insurer said.